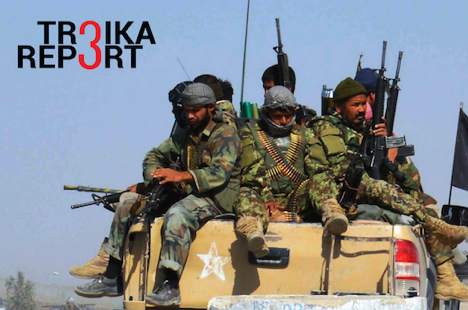 TROIKA REPORT: Is there a Taliban-ISIS double threat to Russia? Russia’s air strikes on what it says are ISIS targets inside Syria have raised the stakes in Moscow’s policy of engaging the West in what it claims is a joint fight against Islamic terrorists. The move has also sent confusing signals over the possibility of re-engaging the West in multi-faceted cooperation, from political dialogue to trade, a partnership ruptured by the war of sanctions over Moscow’s role in the Ukraine conflict. However, the heating up of the situation in Syria comes at the same time as the cooling of hostilities in Eastern Ukraine, which appears to be the product of concerted diplomatic efforts by the leaders of Ukraine, Germany, France and Russia to ensure the implementation of the Minsk peace accords signed back in February. The summit of the four nations, which took place in Paris at the end of last week, was remarkably devoid of name-and-blame rhetoric, with few if any accusations targeting Moscow as the apparent protector of the self-proclaimed republics of Donetsk and Lugansk. The discourse of the four leaders could be summed up in two observations: “None of the articles of Minsk have been respected completely” (Angela Merkel) and the admission that some progress has been made on the military aspects of the Minsk accords (Francois Hollande). But the key message of the Paris summit hangs on the premise that there is no sign of advancement on the crucial element of the agreement, political reform. In essence, the reforms amount to amending the Ukrainian constitution to accommodate the insistence of Donetsk and Lugansk on a special status with guarantees of the observance of human rights, e.g. the rights of ethnic – Russian –minorities. Besides, Germany and France have said the timeline for the implementation of the Minsk agreements can be extended, which gives all sides a little more breathing space. The link between the cautious progress on the Ukrainian front and Russia’s air strikes on targets in Syria is found in the roots of the refugee deluge flooding Europe. The sudden surge of thousands of frustrated Syrian and Iraqi citizens is a result of the crumbling security environment and law and order in these two countries, which now see one third of their territories under the control of militants from the Islamic State (ISIS) radical group. “It’s a premature even to consider such an option. The softer approach to the Syrian crisis by the continental European powers is not matched by their role in decision-making. The stance certain governments in Europe will take is conditional on the preliminary results of the Russian military operation in Syria. “If the results are positive, it will be taken into account in Europe. If the operation does not bear fruit in the near future, and becomes a protracted campaign, there will hardly be any changes in the foreign policy of European nations, with the likelihood that it will lean towards more rigidness, yet relative rigidness. “As for the United States, its position on the Ukrainian crisis is not likely to change at all, not in an election year, and will still amount to ‘keeping it burning’ while not inflaming it more. — If we witness, hopefully, some positive moves leading to normalization in Ukraine, meaning around the Donbass, and the weakening of ISIS in Syria as a result of Russia’s military actions, could we expect the re-emergence of areas of cooperation with the West? Moscow’s double-track policy seems to be aimed at slowly pressing for a political settlement in Ukraine by making the central authorities in Kiev start talking directly to the insurgents in the Donbass, and concurrently setting the stage for a similar conclusion of the civil war in Syria, but with preservation of the Alawite regime in Damascus, with Bashar al-Assad at its head or not. However, on the Syrian track, Moscow’s offer to form a wide coalition was not welcomed. It looks like the West finds itself at the same initial stage as it was in April 2014, when the Ukrainian army launched its offensive against the self-proclaimed republics in the Donbass. At that time, the Minsk agreements and, in general, cooperation between Berlin, Paris and Moscow was still a distant prospect. Nevertheless, the two conflicts, Eastern Ukraine and Syria, despite their apparent differences, offer Moscow’s diplomacy a chance to engage the West. Whether this gamble succeed or not is the multi-billion dollar question. 2. Two coalitions against ISIS: What next for Syria? 3. Is there a Taliban-ISIS double threat to Russia and Central Asia? The sudden deterioration of the regional security environment prompted Tajik President Emomali Rahmon to fly urgently to Sochi to meet Russian leader Vladimir Putin and discuss, among other things, the strengthening of “bilateral military-technical cooperation” and additional effective measures to make the southern border with Afghanistan as impregnable as possible. Meanwhile, Ramzan Kadyrov, leader of Russia’s Chechen Republic, met with Afghan Vice President Abdul Rashid Dostum. After the meeting Kadyrov voiced the opinion that Russia should provide substantial assistance to Afghanistan in blocking the advance of the Islamic State (ISIS) radical militant group, which is now targeting this region too. However, Moscow-based experts with a career in security services, diplomacy and academic studies have conflicting views on the likelihood of Russia’s readiness to go one step further than its current pre-emptive preparations and get directly involved in assisting the Afghan government to fight off the Islamist militants. There is also no consensus on the level of security threat to Russia and Central Asia from the expansion of ISIS jihadists’ outreach to Afghanistan. So how serious is the threat of the Taliban consolidating control of an area in the vicinity of Russia’s Central Asian allies? Alexei Malashenko, a security expert at Moscow's Carnegie Center, claims the danger is being exaggerated. However, this opinion is disputed by another expert. Troika Report approached General Vyacheslav Trubnikov, former First Deputy Minister of Foreign Affairs, former Director of the Russian Foreign Intelligence Service, and former ambassador to Afghanistan, for his insight into the matter. Should the recent victories by the Taliban convince and persuade Moscow that it is better to act pro-actively than retro-actively by enhancing security along Central Asian borders? “My personal opinion is that the situation in Afghanistan has never been calm or stable. Russia and its allies under the auspices of the Collective Security Treaty Organisation (CSTO) are well aware of these dangerous developments inside Afghanistan. The recent CSTO summit paid due attention to these developments. It is essential for all the CSTO member states to be always on the alert. — Given the air strikes currently being carried out by Russia in Syria, is there a possibility that a similar operation could be undertaken in Afghanistan? — What countermeasures would it make sense for Russia to take in a pro-active mode? The resurgence of the Taliban, after displaying a higher degree of military operational skill during the attack on Kunduz, as well as reports that some of its units are merging with or being subjugated by ISIS militants, adds uncertainty to the fate of Afghan President Ashraf Ghani and to the preservation of a secular regime in Kabul. The international jihadist forces now assembling in Afghanistan are a destabilizing factor for the entire region. This sounds an alarm bell for Russia and its allies in Central Asia, which sooner or later will force them to undertake pre-emptive action. TROIKA REPORT: To undo or not to undo the UN?